This course is co-sponsored by I.E.E.E. ( The Institute of Electrical and Electronics Engineers, Inc.) with discounts available for I.E.E.E. members. This unique comprehensive course will cover general and detailed principles used in the protection of medium and low voltage power systems and the principles necessary for performance of a protective device coordination study. Knowledge of protective device operating characteristics and their impact on arc flash hazards within a system are crucial. This course is designed to answer your needs as a designer of power systems related to the integration of protection, proper application, function, and safe operation of electrical systems. Why is this course unique and necessary to be up-to-date in coordination techniques? Probably the only course in the industry which addresses what it truly takes to provide a "fully selective" system of protective devices. 8+ hours are dedicated to coordination analysis of different types of systems submitted by the students or selected from similar systems encountered by the instructor. Arc flash study concepts combined into course along with the effects of arc blast hazards and its impact on coordination studies. 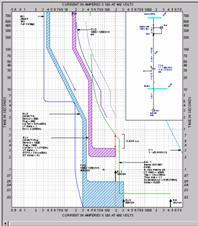 2008 NEC Article 240.92 changes allow for engineering design of feeder taps using principles of this course without blindly applying older tap rules. All computer software used for device coordination plots time vs. current curves but are they valid and do the plots tell us what we need to know? This course does not teach software. Instead, it teaches what all of the other courses leave out including "What time-current curves cannot tell you about coordination." Although the depth of the material is geared for electrical engineers, many plant electrical technicians responsible for system protection and equipment have found the material extremely useful in their job. More details are available in the course brochure or in the topical listing. This course is structured to provide information and methods needed to conducting a short circuit and protective device coordination study for both low voltage and medium voltage distribution systems. Materials include tips and techniques not found in other courses or books on the subject. These tips are guaranteed to save you time and avoid mistakes in your system designs. In addition detailed coverage of proper protective device selection and application is provided. The instructor's 45+ years of experience in commercial, industrial, government, and utility systems will guide you in techniques that can be used during the initial layout of a one-line diagram so the protective devices in a system can be coordinated. Because the instructor is a full time practicing engineer, you will be able to draw from the instructor's current real world experience in these topic areas. Unlike other industry courses, It is not training in how to use a specific type of software. You do not even need to bring a computer to class. Whether you use such as EasyPower, EDSA, SKM, ETAP, or Cyme, or a "stubby pencil", you will benefit from this course. Twelve hours are devoted on the fourth and fifth days to actual practical examples of system design with coordination as the goal. The practical examples have been taken from actual power systems including those brought to class by the students. Students will make all technical decisions during the practical examples. During short lab exercises, students will test actual relays or breakers and thus receive "real world" experience in how digital relays, electro-mechanical relays, and molded-case breakers perform against published curves. Additional lab exercises will analyze transformer percent impedances to provide the students expanded knowledge of per-unit calculation procedures and fundamentals. These exercises will be especially useful when transformers are set on taps that do not match the system nominal voltage. The student will receive a 200+ page workbook that exceeds the quality of training manuals of most courses of this type. Unlike most courses, each workbook page contains a single lecture slide and appropriate comments by the instructor designed to facilitate and minimize note taking by the student and to provide a more useful future reference. In addition each student will receive a copy of the book "A Practical Guide to Short-Circuit Calculations, 3rd Edition" by Conrad St. Pierre. , a $125 value. 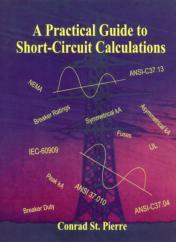 This book is one of the most comprehensive and useful resources in the industry for day-to-day use by engineers performing short circuit calculations and applying circuit breakers in all types of systems. It will be used as a reference during this course. Lastly, each attendee will receive a CDROM that captures all of the audio and projections of the lecture during the last day during the sample problem sessions. Day 4 and 5: Actual sample problems for various types systems in which students analyze and coordinate the protective devices in the chosen systems. Sample problems are extracted from those submitted by students or from actual systems encountered by the instructor. The samples are designed to expose the student, to the maximum extent possible, to real world problems. In addition, time is devoted to per-unit calculations, relay test result analysis, and current transformer burden calculations using real world equipment. A CD is provided that captures all on screen audio and video during days four and five. 3.3 CEU's (33 PDHs) will be provided for through the I.E.E.E. Education Program for those students needing professional continuing education credits. Participant slots are limited to 12 to maximize student involvement. Early bird discount available. See registration form. The course runs from 8 AM Monday through 10 AM Friday. See course information for CEU/PDH's. If you cannot register for the planned dates, please send us an email of your intentions or date preferences. Do you have your own preferred dates and locations in mind? If so, contact us. The above courses. related to fundamentals of power system design. are planned for the calendar year shown and are joint effort training offered by Quadrelec Engineering, the I.E.E.E. Educational Program, and at times EasyPower Inc. of Portland Oregon, developers of the EasyPower® software. The courses are designed to give the student working level engineering skills in both the topic area. For a current course brochure click here. To optimize your training funds, on-site training at your facility is also available for seven or more students. Course material for on-sites can be customized to your needs with minimal cost increases in the per-student published prices. Training at sites outside of the U.S. may have other requirements. [$$] The classes noted with this symbol are coordinated with EasyPower Inc. and subject to their training dates. Check the EasyPower Support/Training website for EasyPower® hands-on classes that may be offered the week after these courses. Attendance at these sessions will optimize your training experience. During our course you will learn the analysis fundamentals prior to learning to use the software. This will enhance your learning experience at the EasyPower Regional Hands-On session. Pulp and Paper, Petrochemical, Major Manufacturing Plants, U.S. Navy, U.S. Army Corps of Engrs., FAA, nuclear generation (Canada), nuclear material processing plants, hydroelectric generation, numerous consulting engineers and utility companies, international oil and gas companies, ASCO, Kohler, and General Electric. IEEE CEU's: IEEE Continuing Education Programs are peer-reviewed by content experts. This peer review guarantees both quality of the technical content of learning materials, as well as adherence to IEEE’s strict criteria for educational excellence. All programs that pass this strict process are entitled to award IEEE Continuing Education Units (CEUs), recognized as the standard of excellence for continuing education programs in IEEE’s fields of interest.